Now that piles of snow and sub-freezing temperatures are in our rearview mirror, it’s time to dust off those gardening skills and help improve our campus environment. One group in particular, UW-Sprout, is striving to freshen up campus and provide agriculture and education to those in the University of Wisconsin–Stout community. 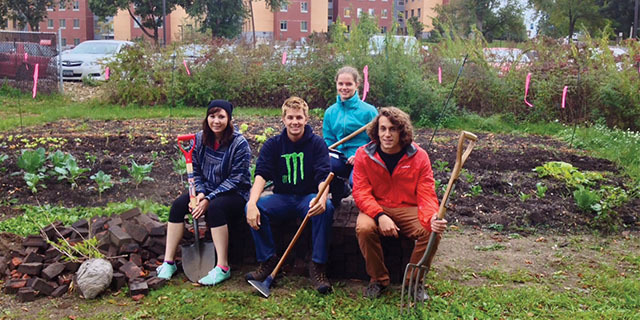 Stemming from Stout’s Sustainability initiative, UW-Sprout is a student group that provides and maintains a garden located on North Campus that promotes environmentally friendly practices. “As far as providing, we want to reach out to students, staff and the campus community about education, about growing your own food, being active and working hard to grow your own food,” says the UW-Sprout garden manager, Katie Ankowicz. She is a junior in the environmental science major with a concentration in plant science innovations and a minor in sustainable design. The fact that Stout is able to benefit from growing its own produce is UW-Sprout’s number one priority. “It will hopefully function like any other garden. There’s a lot of hard work that goes into it, and it’s rewarding when you grow your own food; it’s pride almost,” she says. According to Ankowicz, it’s also critical for the community to experience and implement sustainable practices, which the campus hasn’t been able to do in the form of gardening for quite some time. If you’d like to learn more about helping with the UW-Sprout garden or any sustainability initiative, make sure to visit the Wellness Fair on April 1. Email the group at uwsproutgarden@uwstout.edu or contact Stout’s Sustainability Office.